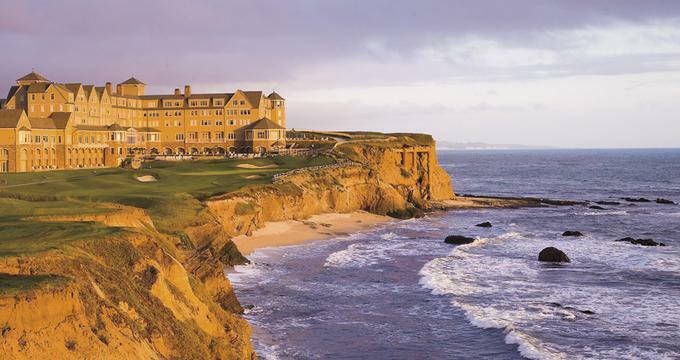 The Ritz-Carlton Half Moon Bay Resort is a luxury getaway on the Northern Californian Coast, about one hour from downtown San Francisco. This is is a destination for golfers and health spa enthusiasts alike. The resort offers two golf courses: the Old Course, originally designed by Francis Duane and Arnold Palmer, and the Ocean Course, designed by Arthur Hills in 1997, featuring ocean views from all 18 holes. Combine active rest with some relaxing time at the luxury spa. The 16,000-square-foot spa and fitness complex offers 16 treatment rooms, whirlpool, steam rooms and sauna facilities. There is also a co-ed Roman Mineral Bath and an oceanfront Jacuzzi with calming views of the ocean. The fitness center, which overlooks a lawn and the ocean, features Cybex cardio machines, weight training equipment as well as daily aerobics and yoga classes. In addition to golf and fitness, guests can choose from numerous other activities. There is a scenic path along the coast which can be used for jogging and walking. Guests can also relax on a nearby beach, bring a picnic basket, play tennis or basketball. For event planners, the property provides 17,000 square feet of meeting and event space, including a ballroom which can accommodate 400 guests. There are 261 guest rooms and suites, located in the six-story main building and three adjacent guesthouses. Two thirds of all guest rooms have ocean views and many have a fireplace, balcony or window seat. The rooms also feature marble bathrooms with a separate shower and bathtub. Guests can work from their rooms which provide high-speed Internet access and computer and fax outlets. Dining options include Navio which serves coastal cuisine from a 1,000-square-foot display kitchen and the more relaxed Conservatory serving light cuisine throughout the day. In the evening, guests can relax at the Bar with live entertainment and an extensive list of California and international wines. The resort is conveniently located 30 minutes from San Francisco International Airport and one hour from Silicon Valley and downtown. Nearby activities include horseback riding, deep-sea fishing, whale watching, sea kayaking, biking and antiquing. The property can be reached by car in 30 minutes from San Francisco International Airport. If you would like to have the hotel arrange your transportation, you can call the resort Concierge at 650-712-7601. Browse more great golf getaways. The resort offers several packages, including a Bed and Breakfast Package from US $395 for two as well as golf, babymoon and spa packages.